Rune stones are divination tools used to help individuals to make life-altering decisions. They are often made from glass, wood, or stones. They come in sets of 24 stones, if the Elder Futhark alphabet is used, and have ancient letters carved onto them. Each symbol has a different meaning. Many times, when you acquire rune stones, they will come with a booklet that explains the meanings of the stones. The Elder Futhark alphabet is the oldest, but there are several other deviations that can also be used that utilize up to 33 symbols. Rune stones originated with ancient German and Nordic tribes. Their usage spread across Europe with Anglo-Saxons, and they are still a very popular tool today. The word “rune” translates to “whisper” or “mystery”, which solidifies their usage in telling the untold. 1 What Can Rune Stones Be Used For? What Can Rune Stones Be Used For? Runes are used as a way to communicate with your own subconscious. They do not hold answers in and of themselves. They also do not tell you what will definitely happen—they only let you know what may happen if you journey down a certain path. They are useful in helping people to get an idea of a possible outcome to a situation. They may give indication toward answers to your questions, but ultimately, it is up to you to decipher them. Most people ask the runes about issues in their lives or specific questions. A common way to approach working with rune stones is to ask, “What will happen if I do ‘x’?”. The runes will help to give the interpreter an idea of what effect making that choice will have on their lives. Rune stones do not give an exact answer, nor do they predict how many kids you will have or questions of that nature. They do not tell fortunes but rather give us insights to help the individual seeking answers to make decisions. 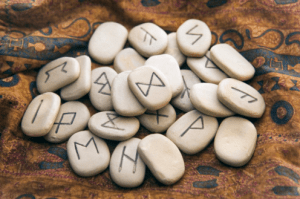 There are many different methods to reading rune stones, but for the most part, they involve some form of placing or casting. Casting is the term for tossing rune stones, seemingly randomly, in order to find an answer to your question. Casting should be done in an east-west fashion upon a white cloth. The stones should be cast from a leather pouch in which they are kept. Here are some methods for casting or placing that you can experiment with and see which works best for you. For more simple questions, you can focus on your question and pick a single stone out of the bag and contemplate what that stone may be telling you. Focus on a little broader issue you may be struggling with, pick three stones, and lay them out in front of you. Meditate on what the stones may be telling you about your current situation. One way to interpret these stones is that the first is your current physical condition, the second is your present mental condition, and the third is your present spiritual condition. Another way to interpret a three-stone spread is that the first stone you pick gives you the answer to a past issue, the second stone is the answer to a present issue, and the final stone is the answer to a future issue. Think about a situation you would like guidance in (past, present, or future). Gently toss the stones. The stone or stones that stick out the most to you will hold your answer. Lay all of the stones out in a grid. Concentrate on what you want an answer for. Move your non-dominant hand over the stones, and when you are over the stone that holds your answer, you will sense it. Lay out five stones in a cross pattern with one central stone and four other stones around it at North, South, East, and West. The middle stone represents your current problem or state of mind. The east stone, to the left, represents the past. The west stone represents what you need to deal with or overcome. The south stone represents something you must accept. Finally, the north stone represents what to expect once you have moved through the obstacles posed by the other stones. All these methods can be tailored toward your own specific means, and you can take time to experiment with what you connect with the most. You may even come up with your own way to read and interpret the stones. The most important thing to keep in mind is to treat the stones reverently and realize that they are merely a tool to unlock your own potential. In addition to their obvious meaning, they also hold deeper more interpretive meanings. Finally, the stones have even another meaning if they are cast and are shown on the opposite, reversed side. These are examples of different interpretations for just three of the 24 main stones in the Elder Futhark alphabet. There are many other possible interpretations, and you may have a personalized reaction depending on your experiences when you are presented with the stones. There is no absolute way to read the stones. They are a tool to communicate with your subconscious, so your experience with them should be individual. Rune stones are interesting objects that have a rich and fascinating history. They are very useful if you are feeling lost, confused, or just want a little bit of extra help getting through this roller coaster of life.